The kits come packed in attractive little calico bags making them ideal gifts. The new blue Zweigart canvas makes the stitching of the background unnecessary and the illustrated instructions are very easy to follow. 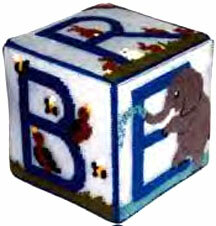 They can be made into cushions, cubes or samplers or simply joined together to spell names or sayings. These animals make great starter kits for people wanting to get into needlepoint for the first time. Only Letter O available in stock. 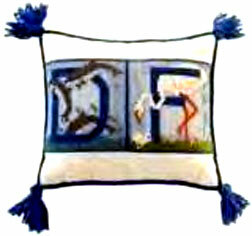 Other letters are availalbe by special order at a price to be determined.